Your exome is the 50 million DNA bases of your genome containing the information necessary to encode all your proteins. Informally, you can think of the exome as the DNA sequence of your genes. Your entire genome is made up of your exome plus other DNA, consisting of three billion bases with repetitive sequences, sequences of unknown function, and DNA that does not code for proteins. Note that the Exome 80x test is only available to current customers, and is determined on a “first come, first served” basis. Further, test-takers will initially only receive their raw data of 50 million DNA bases at 80x coverage, but 23andMe plans to develop new tools to take advantage of exome sequencing. ... Click to read more! 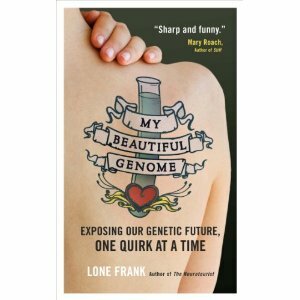 “Internationally acclaimed science writer Lone Frank swabs up her DNA to provide the first truly intimate account of the new science of consumer-led genomics. She challenges the scientists and business mavericks intent on mapping every baby’s genome, ponders the consequences of biological fortune-telling, and prods the psychologists who hope to uncover just how important our environment really is – a quest made all the more gripping as Frank considers her family’s and her own struggles with depression.” ... Click to read more!